Facts and information about the History of Clothing and regalia of Native American Indians and their Moccasins. The customary shoes worn by American Native Indian tribes were called moccasins, a name that originated from the Algonquin word 'makisin'. The color, style and design of moccasins varied from tribe to tribe, as did the materials they were made from. Traditional moccasins were shoes made of deerskin, or other soft leather, the sole and upper part being one piece. They were sewn and secured by strong sinew or buckskin. Additional interesting information and facts, together with pictures of moccasins, are described in this article. The history of traditional or ceremonial dress and regalia worn by Native American Indians is a fascinating subject. The following fact sheet contains interesting facts, meanings and information on Moccasins. 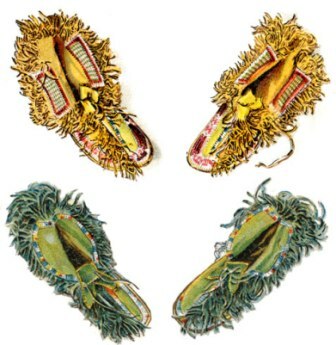 The pictures provides a fast overview of the different styles, designs and patterns of moccasins worn by the Blackfoot, Iroquois, Sioux, Omaha and Kutchin Native American tribes. Moccasins Fact 13: The Apache and Navajo used a high, boot-like moccasin. Moccasins Fact 15: Heavy duty boots called mukluks were worn by tribes who inhabited the cold northern areas like Alaska were the invention of the Inuit tribe.